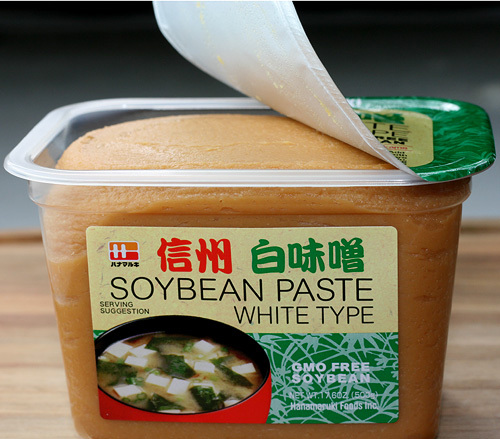 White Miso is a fermented paste made from soybeans, salt and either rice or barley. It also comes with other seasonings added such as pepper, ginger, etc. It is not actually white; it is more yellow or beige, and smooth and creamy. It has a mild, savoury taste. It is perhaps the easiest miso for beginners to start off with and get used to, owing to its milder flavour. It typically undergoes a fermentation period of about three weeks. Advice varies, even amongst the Japanese as to whether the lighter, less salty-tasting White Miso or darker, saltier Misos are better used in winter cooking or summer cooking. Generally, people agree that darker misos are better for miso soups. High in sodium. Depending on the brand, it may have a lower salt content than red or brown miso. Will keep indefinitely in fridge in a covered container. Evolved in the southern parts of Japan.